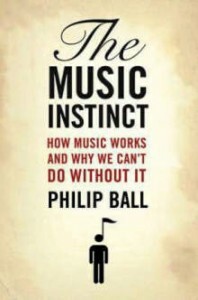 Philip Ball regards music as an indispensable phenomenon with multiple meanings for human culture and physiology. Transforming complex sound into comprehensible and meaningful music is a complicated and demanding feat, but one to which our brains are inherently attuned by the mere fact of living in the world. We are pattern seekers, clue-solvers, unravellers of sensory data, and also communicators and storytellers. Within the auditory domain, those things are going to make us musical beings, come what may. All the same, we have to learn these skills. From the moment of birth and in fact from some time before that, we assimilate and generalize the information we receive about our environment. We make mental maps of how stimuli relate to one another. We learn about what is more or less probable, and we use that to make predictions and form expectations – about notes and note sequences, harmonies rhythms, timbres. We test these against the real world, and we congratulate and reward ourselves when we are proved right. We learn too the enhanced pleasures of delayed gratification and suspense. And there is something more, something that is as yet barely understood or even appreciated: a kind of delight in complex experience, in texture and sound quality, in a massaging of the auditory sense. This doesn’t necessarily produce emotion in itself, but creates a susceptibility to expression, a kind of willingness to be moved. Composers and musicians intuit these human characteristics and figure out how to toy with them. They provide sonic signposts both to heighten tension and to aid cognition: they help us to hear. And if they fail to do that, their music becomes marginalized, intellectualized, mathematicized. But even then, our musical sense is hard to baffle totally: we can find exciting stimuli in the most unlikely places, perhaps even in the face of the composer’s intentions. But it is performance that breathes fire into the formulas, so to speak. Certain patterns of notes work better than others, but the good performer knows how to rearrange and stretch and embody them in ways that turn a good tune into a soul-wrenching experience. This skill is hard to teach, but not impossible: it is not a mysterious gift, but requires a sensitive understanding of how music functions. And yes, music is intellectually utilitarian: it is ‘good’ for the brain. But that’s a happy by-product, not a justification. After all, music is good for the body too, and good for the culture. In short it is, as Nietzsche said, ‘something for the sake of which it is worthwhile to live on earth’. We should never forget that music takes place in a social context. If all studies of music cognition tend to give the impression that it happens in a value-free vacuum, this danger is particularly acute when we consider the question of meaning. The American perceptual psychologist James Jerome Gibson argued in the 1960s that the cultural context of stimuli intervenes in the actual process of perception -that’s to say, we don’t first hear music and then interpret it within a context, but the context partially determines what we hear. This is one of the pitfalls of cross-cultural studies of music cognition, which tend to assume that if you play music to different people, they simply make different interpretations of the same sounds. All the same, music from other cultures need not be a closed book. Our minds can usually do something with it, although that is likely to happen on our own cultural terms unless we make considerable efforts to reach beyond them.